Awesome Apollo says it all. This beautiful recently remodeled condo with new carpet, new sofa-sleeper, new linens and furnishings and furniture is located directly overlooking Marco Island's beautiful beach on the southern (quiet ) tip of the island. Since we handle our own rentals, we can rent our condo at the lowest rates available. Our condo is a corner unit on the 9th floor of a ten story building. It offer a fantastic view of the beach directly in front. It also has a great view to the the south of Cape Marco. It has a full length mirrored wall that reflects the Gulf. The new carpeting in the living room and bedroom gives it a much warmer feeling. Most other Apollo units have tile floors. 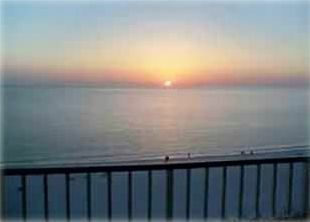 The balcony offers a spectacular view of the Gulf and beach. We love to simply sit on the balcony and watch all the beachcombers and other exciting beach activities. We especially love to watch the beautiful sunsets from the balcony. We also enjoy lunch and breakfast from the balcony. The Apollo offers great facilities including a casual restaurant and bar with outdoor seating open from 11:00 am to 10:00 pm daily. It has an elegant lobby, on the premises security, lovely landscaped grounds, a heated swimming pool, hot tub, tennis courts, sauna room, fitness center with showers and covered parking. There is direct beach access right in front of the Apollo. Marco Island is famous for its beautiful noncongested boulevards, no over-commercialization, and fantastic clean sandy beaches. It is indeed a vacation paradise. We and our repeat rentors just love it here. You will too. Harriett Toxopeus is the owner of Awesome Apollo. It is managed by her daughter Sandy Toxopeus. Harriett and her late husband Fred Toxopeus purchase the condo in 2003 after renting a similar unit for a few times. They have spent their winters in a double-wide home in Goodland, FL only seven miles from Apollo. They have also spend selected weeks in their lovely Apollo condo. The late Fred Toxopeus retired after teaching mathematics for fifty years in High Schools and a community College. Harriett is retired after working as a dental receptionist and bank manager for several years. They have three grown children and six grandchildren and two adorable great grandchildren. Fred enjoyed tennis, slow pitch softball, skiing and riding bicycles and motorcycles. Harriett enjoys cooking, shopping and walking the beautiful beaches of Marco collecting sea shells. They had vacationed at Eagle's Nest with friends in Marco and loved it. The next year they rented a unit in Apollo and liked it even better. They decided to buy a unit to rent out and also to use it themselves. The condo is fully furnished with new furniture and with many pots, pans, and other cooking items. Harriett is a gourmet cook and has every item you need. There is a nice restaurant, bar called Sunset Grill in the Apollo which is very convenient.. The big attraction is the balcony overlooking the beach. One can watch beautiful sunsets and also Dolphins frolicking in the water. (2) Answering machine on the kitchen phone.